EIM Modbus RTU – Welcome to the EMIT Technical Forum! This document describes an overview of Modbus and how it is used in the ETS system. Modbus (RTU) can be used to read a variety of data from the ETS system to some sort of Modbus master device, to be used remotely or on-site. A proper understanding of how the items are addressed and scaled in ETS will help ensure your system setup works correctly. Modbus is a serial communication protocol that is designed for reading and writing individual data items from a set of devices on the serial network. The device sending the commands is called the Modbus Master, and each other device on the network is called a Modbus Slave. Each slave will have a unique address, called the “Slave Address”, “Station Address”, or “Slave ID”. This address can run from 1 – 247. While the register numbers, as referenced in documentation, will be numbered as they are above, it is important to note that in an actual Modbus command the data address (not to be confused with station address above) is always numbered 0-9999, and the register set that is actually read is based on the function code. A command will contain a specific “Function code”, which indicates whether it is a read or write, whether it covers one or multiple registers, and which of the four register sets is used. There are 8 function codes in standard Modbus. As an example, we might want to read register 40002. The Modbus will send a command to the slave ID in question with function 4 (read input registers) from data address 1. Since the function code links to analog input registers, then the slave will know that the data address “1” is referring to register 40002, because analog input registers are register set 40001-49999, and address 1 is the second register (the first being address 0). 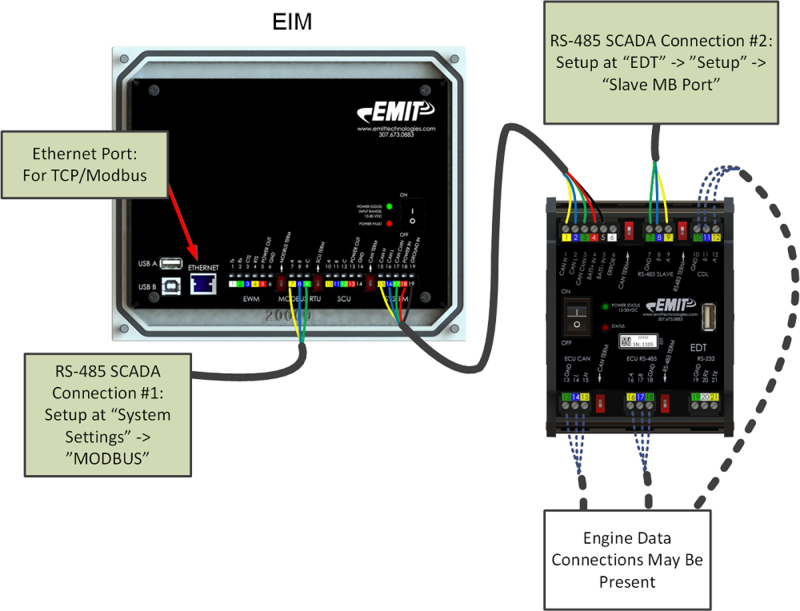 The primary modbus port is the RS-485 connection on the back of the EIM (screen). This port is configured on the Modbus setup page, shown below. Select the correct option in the 'communications' dropdown to match the SCADA system. The most common two port settings used in the field are "9600,N,8,1" or "19200,E,8,1". Wire the SCADA RS-485 A/B connection to the EIM RS-485 A/B connection. If the EIM is in an EMIT panel, this connection may have already be ran to empty terminal blocks for convenience, and the SCADA RS-485 connection can be wired there instead (check the panel schematic). Some panels will have an EDT present, which also has a duplicate slave 485 port in case there are two SCADA systems. This port is set up separately: under the "EDT Setup" -> "Slave modbus port settings". Separately, the ethernet port can be used with Modbus/TCP, and it set up on the 'ethernet' setup page under 'system settings'. Any or all of the three connection options above can be used, but in all cases the register numbers and IDs being read (discussed below) are the same. In ETS, each module in the system will have its own slave ID. However, all Modbus responses will come from the EIM only, which has the Modbus connection. 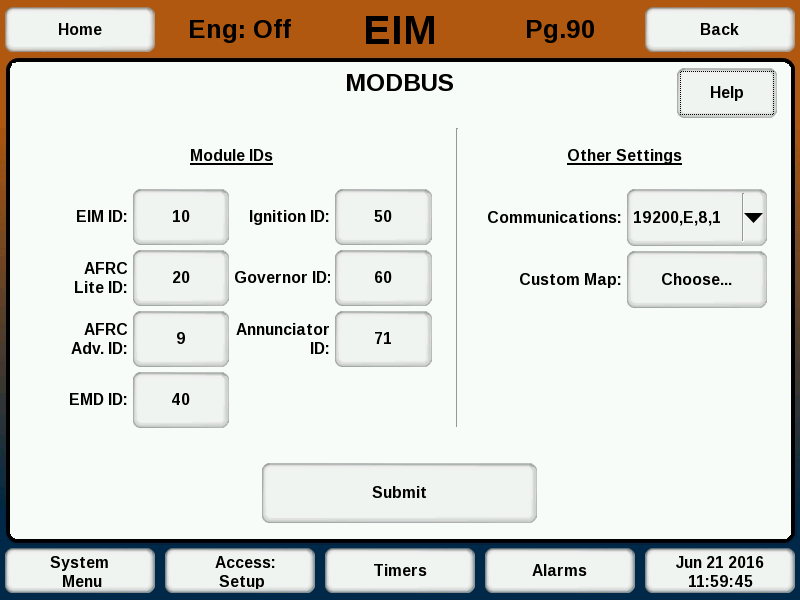 The slave ID can be changed on the EIM on the Modbus screen. For example, the EIM might have an ID of 10 and the AFRC Lite might be connected and have an ID of 11. If a Modbus master command arrives addressed to either ID 10 or 11, the EIM will respond. For any other address, the EIM will not respond. If a Modbus request arrives matching a module ID, but that module is not actually attached currently, the EIM will not respond. Each module in ETS has its own Modbus table showing the data at different registers. An example section of the AFRC Lite Modbus table is shown below. Note also in the table above that there is a separate column for “Register” and “Address”. The difference between the two has been previously discussed, and both are listed for convenience. Different Modbus and SCADA systems use various methods for specifying the register that is read. The register itself might be entered in a high-level program, and it will determine the data address on its own by using the last 4 digits. Alternately, a program might need the data address specified directly. The ETS uses “PLC Addressing” which is base 0 addressing. If this is not an option in a Modbus Master program, the address that is requested might have to be decremented by 1. The response was the three temperatures (Precat, Postcat, and Diff temp) as desired. Modbus Poll sent a “0” as the data address since the PLC Addresses was checked. If the program did not have this option, the same result could be obtained by using the address “0” to refer to address 1. Discrete output coils are for settings that can be represented as binary (0/1 or off/on). For example, valve auto or manual mode. Discrete input contacts are for board inputs that can be represented as binary (0/1 or off/on). For example, the state of the oil pressure switch. Analog input registers are for almost all other values that are not binary. E.g. temperatures, pressures, etc. Analog output holding registers are for settings that can be read and written over Modbus. For example, annunciator alarm limits fall into this category. For versions 1.89 and later, Modbus TCP/IP is supported if the EIM and kernel have ethernet enabled. The register maps and slave IDs are the same whether using Modbus serial or Modbus TCP/IP. Both connections (TCP/IP and serial) can be used at the same time. Additionally, multiple simultaneous Modbus TCP/IP connections are supported. The annunciator modbus table is a section in the document linked in the above section "Modbus Table". The annunciator modbus table refers to sensors by the annunciator input name instead of the sensor name, since the actual sensor name is configurable. Note: If desired, EMIT can generate a table automatically with sensor names added if the annunciator config file is available. If SUCTION sensor is attached to AI-1 (analog input 1), In the annunciator modbus table, register 35150 is "Analog In 1 Reading". Since suction is attached to this input, reading 35150 will get the suction pressure. Note that the "Annunciator ID" has to be used during the read, as mentioned in "Slave IDs" above. The returned value for analog inputs will be scaled to the user value. If one input is 0-250 PSI and another is 0-1000 PSI, the actual range doesn't need to be known because the modbus response will always be in PSI. Note that in the "Unified Data Table", Register 32042 pulls the same value as Annunciator Register 35015 above.